Sold by us last year, this TC will be returning to Pye Corner shortly. In cream with tan upholstery and radiator grille. The MG is a UK car that went to the US early in its life and stayed there until 2008. It was owned and restored by Phil Frank, a cartoonist from the San Francis Bay Area, who created the Nigel Shiftright character in Road and Track magazine. It lived in and around Cambria in California for more than twenty five years before returning to the UK. 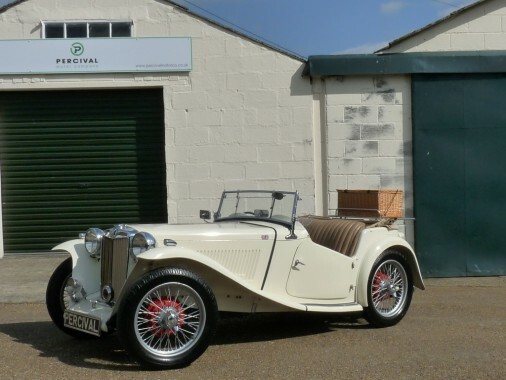 It is was treated to a full, documented, engine rebuild under 4,000 miles ago, by an MG specialists in the States who had looked after the car for since 1980, and runs beautifully. The gearbox is excellent and the car feels nice and tight on the road. Maidstone Sportscars rebuilt the steering box not long ago. Electronic ignition is fitted making it run very nicely. The bodywork is excellent with no signs of rust and the paintwork has light deterioration. The chassis and underside are superb and the wooden bulkhead appears first class. The interior has very little wear. The hood is faded. The dashboard is made of teak with a plaque commemorating Flora Barron, a lady who had contributed to the rebuild of the TC having read about it in the San Francisco Chronicle when Phil Frank featured it in his strips. A very pretty TC with weather equipment including full and hood tonneaus, painted wire wheels and some nifty rear indicator units fitted for safety as modern motorists are not used to folk whirling their arms around to indicate which way they are turning!